Over the past couple of years, Microsoft has slowly started releasing features, services, and even tools that help in migrating to Office 365. For those of us that have completed a migration, we all know too well the pains it can cause. A while back Microsoft announced they were releasing what is called a 1st party migration tool, “1st party” meaning written by Microsoft who are the owners of the service. The tool is not meant to replace the many 3rd party vendors who already offer these tools, but they tried to fill a gap for those organizations that do not want to use a 3rd party tool. This tool is named “SharePoint Migration Tool” or SPMT for short. The application is designed to migrate content from SharePoint Server 2013 or on-premises file shares easily to either SharePoint or OneDrive in Office 365. The problem here is that the tool focuses on content migration, not the many other assets that need to move in a normal migration. To answer this, Microsoft released another component called “SharePoint Migration Assessment Tool” or SMAT for short. The tool is a simple command line executable that scans the contents of a SharePoint farm to help identify the impact of migrating to SharePoint Online with Office 365. The SMAT tool is available in two modes: Assessment and Identity Mapping. The assessment mode runs scans against the SharePoint farm and associated content looking for issues that have been known to cause problems for customers migrating into SharePoint Online. The Identity Mapping mode allows you to generate a report of all the user and group identities that have access to your SharePoint environment and attempts to map those identities to Azure AD user and group identities. To use the tool, navigate to the Microsoft site and click download. The next step is to extract the zip file which will create the folder structure containing the executable. There is no user interface for this tool, and it is run completely using command line syntax. The application utilizes two configuration files, one called “SkipSitesList.csv” which allows the application to skip sites, excluding them from the report. “ScanDef.json” is also available in the same directory, allowing you to disable or enable individual scans within the assessment tool. The current engine will launch either a SharePoint 2010 or 2013 version of the scanning tool, and the engine starts a separate window listing the items found within the current site. 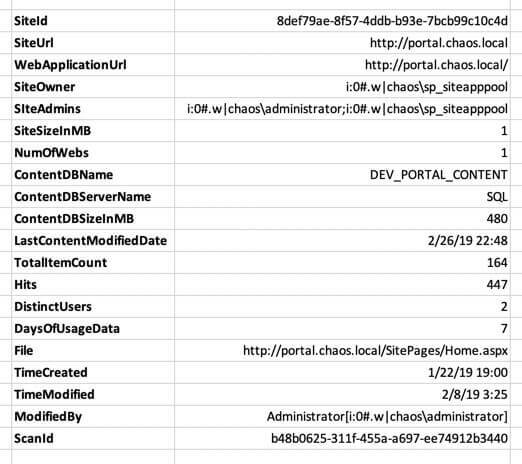 After the application completes scanning, base report details are available within the “Log” directory. This directory contains a log of actions, errors, summary report, site assessment report and all the “CSV” files now populated with data from the SharePoint farm. The “CSV‘ files such as “CustomizedPages-detail.csv” are available to be opened and viewed. These files contain the raw data entries retrieved through the scanning process. Clicking the link takes you to the documentation for that specific item within the SMAT section of “docs.microsoft.com.” The information provided only offers a view of the data but not of the customization found. Though this is useful information for identifying locations of customizations or other assets and features that need checking, it is just information of where items exist and no deep inspection of what has changed. For an organization looking to migrate to SharePoint Online or OneDrive for Business, the SMAT tool works perfectly, at least to give you a log of potential issues that need addressing. However, it does not give you a more in-depth inspection into code items, list where web parts, scripts or even other components are within the site. The SMAT tool assumes that other processes are in place to manage those elements. For a complete migration assessment, Rencore provides a modernization tool as part of the Rencore Platform. This tool not only identifies migration issues but offers a full Server farm review that includes many more items not checked within the SMAT tool. 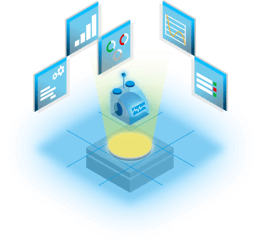 Rencore for Modernization is a component of the Rencore Platform. It has four core sections to assist with migration. Provides a full scan of your SharePoint Server farm, inspecting all items such as Server, Web Applications, Sites Collections, Sub Sites, Lists, External Lists, Large Lists, Timer Jobs and Health Report Errors. During the assessment, all of these items and more are captured and made available within the reporting interface. A vital component of any migration is the ability to know how to migrate, how to update and how to replace functionality. In the learn section, new and useful content is presented, allowing you to drag them in a project board, between columns helping you stay on track with learning. The planning part of a migration, outside of the typical content move, needs to cover all assets and customizations added to SharePoint. Within the plan section, you can see all the identified components which can then be dragged into columns for review, transform, abandon and completed. 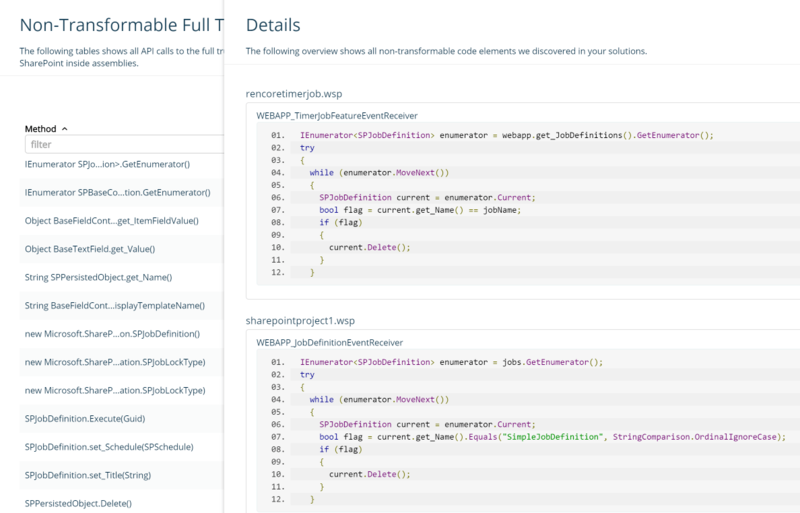 The transform section is about managing the transformation of code assets, once again allowing you the flexibility of dragging the transformation tasks into boards for tracking. So far, the only the difference between Rencore for Modernization and SMAT is the user interface. Second, the listing of Roadblocks for the potential migration at the asset and code level. Organizations can use any of the tools available, whether written by Microsoft or by 3rd Party companies. However, when evaluating a tool that is going to help with migration from on-premises to the cloud, you need to make sure it covers the most essential and critical assets and components to the business. Too many tools exclude applications and customizations, or try to move them as -is, which in its self can cause many issues. Our recommendation is to use Rencore for Modernization for analyzing your SharePoint on-premises server farm for migration. Not only do you get an extensive inventory of the farm, but you also get the code analysis, and roadblocks view to help you to know what can migrate easily and which elements have dependencies that stop a migration.